Etched brass kit. Includes sprung buffers. 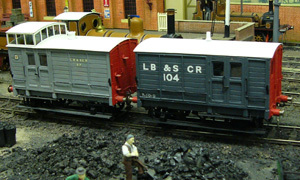 At least 160 of these vans were built between 1872 and 1888 to LBSCR Diagram21 (SR Diagram 1564). Identical vans were built for the Engineers Department and many similar vans were also built to Diagram 33 (Taller on roof centreline) and Diagram 27(1.75" narrower). The lantern roof lookouts seem to have been removed between 1900 and 1910. From 1920 some of them were close coupled in pairs to give extra braking power. Revenue earning vans disappeared by 1926 but at least one departmental one lasted until 1938. There were also 2 or 3 on the Isle of Wight Central Railway, but these had detail differences. 3ft spoked wheels and couplings required to complete. Both variants shown, but only one vehicle per kit! Models built by Roger Cornwell.